MEET THE TORONTO BASED FULL-TIME ARTIST WHO'S TAKING THE ART SCENE BY STORM. AS PASSIONATE ABOUT MENTAL HEALTH AND WILDLIFE AS HE IS ABOUT ART AND SPIRITUALITY, HE'S THE ULTIMATE JACK OF ALL TRADES, AND HE'S BLESSING US WITH HIS EYE, ONE PIECE AT A TIME. AH: Ok so you're an incredibly talented artist, but we've got to know, have you always been so talented? And when you say you're an artist, what kind of art are we talking about? 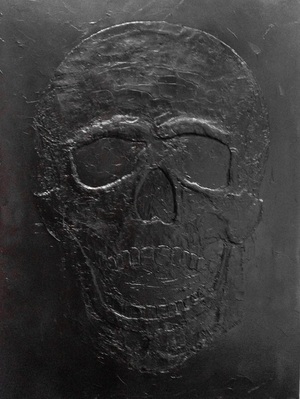 RJ: My techniques are all self-taught and I use a wide range of mediums to produce unique effects. One could call me an urban abstract painter and sculpter as my mediums range heavily from graffiti street art murals to fine art portraits sculpted with palette knives using thick heavy bodied layers of acrylic. My art has come back to me after many life struggles and through the spiritual guidance of my Buddhist monk. AH: That's amazing. What got you into art in the first place? RJ: My family has always been artistic and creative and art has always been a passion of mine. It was more so displayed in other forms when I was younger such as athletics when I was playing basketball professionally. However, when I went through my struggles art became therapy for me and brought me back to creative self when I couldn't find an outlet. AH: So inspirational. Honestly. Who were your mentors? Did you have any? RJ: My cousin was my main mentor. He went from being homeless doing graffiti pieces to becoming a world famous artist despite many setbacks. As artist go, he's the most inspiring person for me. AH: Who do you look towards for inspiration? What inspires you? RJ: For inspiration I look towards my Buddhist monk, Bhante Saranapala. He is full of happiness, love, and light and every time I see him and listen to his words of wisdom I always become inspired to create and my mind opens up to endless ideas. AH: What are some of your most memorable pieces? Any personal favorites? RJ: My most memorable pieces have been the first one that I made after getting back into art. I picked up my palette knife and started angrily painting and so many emotions came out. Anger, tears, joy amongst many others and I felt a huge release while creating. Also a large colourful Samadhi Buddha statue painting that is going to be a gift for my monk to hang at his temple. He saved my life and it's a small gesture to thank him for everything he has done. I will be speaking on his behalf this summer at a world peace summit and I will be presenting it to him on stage that day. AH: Oh wow, that's phenomenal. It's so amazing that you can translate your emotions into art so fluidly. Have you always been artistic? RJ: Yes always. My mother was the most amazing artist I had ever seen, but she gave it up when she had me. My cousin is a famous artist. I always was artistic as well, especially at a young age, and then, as I got older my creative side came out more in sports and fashion. However, I was always surrounded by art and always coming up with ideas of things I want to create. AH: No wonder you're so seeped in talent. What's your favourite thing about being a creative? RJ: There are so many things that I love about being creative. There are endless possibilities that an artist can do. I take pride that I can use so many styles and mediums to create. 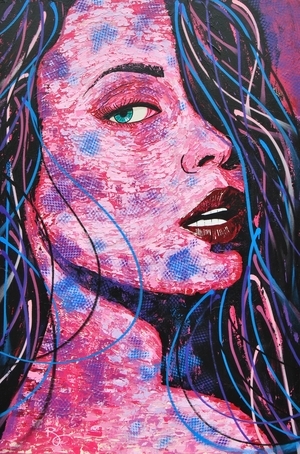 Whether it's a graffiti street art style piece or a portrait sculpted with a palette knife in thick layers of acrylic, I love all the processes. I get bored easily with one style so I am always changing it up and challenging myself to create something entirely new that I haven't tried yet. AH: Absolutely. Seems like you've got some great perspective, both in life as well as with your pieces. RJ: Art in a way saved my life, as well as Buddhism. By finding spirituality through Buddhism and my monk it opened almost a sixth sense that now is coming out in my art. Through each piece one can see my transformation portrayed. When times were very dark so were the subjects and colours and as my journey progressed my art became more colourful and vibrant. AH: So fascinating. We love how you've overcome so many challenges and used them to created this resilient creative powerhouse that you are. There must also still be challenges with the art though, what do you feel is the most challenging aspect of creating a new piece? RJ: Just getting that first stroke or spray onto a canvas. I usually have a vision in my head of what I want to do and how it will look and once I get that first stroke down I then lose myself into the piece for hours and hours on end. Sometimes I will paint for 14 hours straight without stopping. AH: Woah - that's quite some time. It must be as exhausting as it is exhilarating. You've mentioned you're passionate about wildlife and mental health, do you think those passions play a role in the pieces you create? How not or how so? RJ: Those passions, including children with autism, are actually more so charities that I want to get involved with and donate as much as possible to. I would love to have my own foundation that benefits those areas. AH: Aw, that's sweet, and very inspiring. We're sure you're going to be able to have just that. What do you hope your art does for people? What would you like your legacy to be? RJ: I want my art to be a pathway for others who have gone through similar experiences as I have to be able to be open and express those experiences without apprehension. I want to be able to donate to charities that I believe in and give back to those that helped me through my struggles. AH: So admirable. Well it's clear you're a true artist with a true passion and a hell of a lot of heart. We're so touched you took the time to chat with us! For those of you wishing to learn more about Ryan Joseph and his art, feel free to check out his website at www.ryanjoseph-art.com.